He is the blue dragon and has dragon eyes that allows him to see great distances. 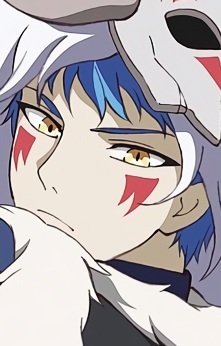 Shin-Ah's dragon eyes are also capable of disrupting the nerves of anyone he glares at until it kills them. Later in the story, his power was explained in more detail. His victims are subject to fatal hallucinations. In extreme cases he can cause their entire bodies to stop functioning, including their hearts. However, he does not have full control over this power and will lose himself to the blue dragon's murderous willpower. When he finishes using that ability, he himself becomes paralyzed as a result, making the power a double-edged sword. He almost lost complete control when Yona was captured by some bandits (they were in the fire tribe and Shinah was assigned to protect Yona), causing them to have hallucinations after his mask was knocked off by a bandit. However, she wasn’t afraid of his power and saved him from losing to his power (though it wasn’t easy because he lost himself and didn’t recognise her). He was scared that he wouldn’t be able to stay by Yona’s side anymore and she would hate him because of this. But she reassured his importance to her and to continue to stay with the group.